Chinese while building the Great Wall of Chine (over 2,000 years ago). The Chinese fermented the cabbage in rice wine instead of the standard salt fermented cabbage most of us are accustomed to. 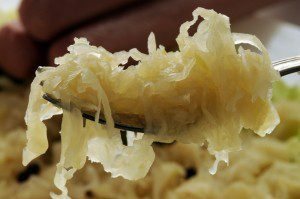 Sauerkraut was thought to have been brought to Europe 1,000 years later by Genghis Khan. Sauerkraut stood the test of time because of its preservable nature over long journeys aboard ships and across long stretches of land. Kiełbasa Polska is the most popular kielbasa which can be found in North America at Polish stores and most major grocery chains. Kielbasa can be served cold, hot, boiled, baked or grilled. My adopted father ate a lot of sauerkraut along with liver and onions and spam for breakfast. 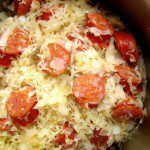 I was never a big fan of liver and onions or spam, but at least once a week the smell of sauerkraut permeated the house all day, slowly cooking in a kitchen crock pot. Sauerkraut and kielbasa or sausage is generally cooked in a crock-pot after frying the kielbasa to bring out its flavor. Cut kielbasa into 1 inch pieces. Dice onion. Heat a large frying pan with 1 tsp of olive oil and 1 tsp of salt. Brown the sausage about 3 minutes each side. Remove sausage and set aside. Heat crock pot to 250 degrees. 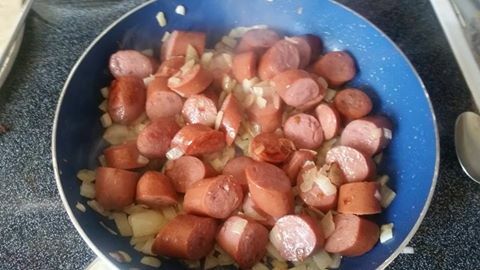 Add in sauerkraut, sausages and onion and cook for at least 3 hours and up to 6 hours, stirring each hour. Get the News & Recipes from BillyO’s Kitchen – Free!